In this game (based on the 18xx series) you act as an investor in the 19th century in the Netherlands, trying to earn as much money as possible with buying and operating railway companies - and trading the shares of the companies at the stock market. The first print is limited to 1000 copies, and the quality is really more than convincing. Thick card board is used for the board - and the cards, the money and the wooden cubes fit to the topic pretty well and will also endure a lot of games. You will like the gaming material for sure. The game consists of 15 turns, whereas one stock round is always followed by two operating rounds. In the stock rounds each player can buy and sell shares of more or less promising railway companies. In the operating round each player acts as managing director of the companies, where he owns the majority of shares. For these companies he has to purchase trains, build tracks, establish payable routes and decide if the profits are kept in the company or divided among the shareholders. Finally (after the 15 fixed turns) the investor with the most money (and valuable shares) wins the game. 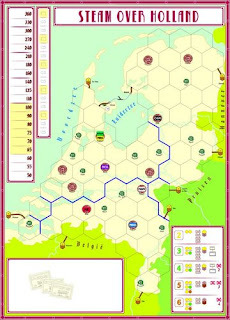 Basically Steam over Holland is a light variant of some rather complex (and time consuming) games of the 18xx series. 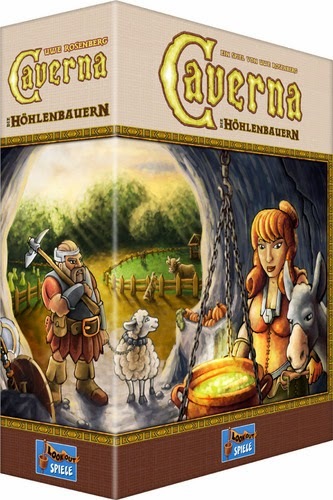 Nevertheless a lot of strategic decisions have to be taken and the game comes with a lot of depth in terms of gameplay. It's a good introduction in the mechanics of 18xx games,and gives you the chance to find out if you like these kind of games or not. I found out that I definitely do like them - as I really like the economic simulation aspects (stock market, buying and running railway companies). So, if you are just slightly interested in the topic I really propose to give "Steam over Holland" a try. "1839, The Netherlands. The new railways are the way to get rich. Invest your money in the best railway companies. Become the President of one or more companies and lead them to become the best earning companies of the game. Build new track and stations, buy the right trains and push the stock value to new heights. Who will become the most successful investor?" 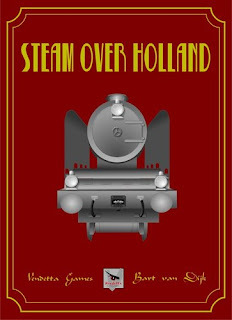 Steam over Holland is an economics game in which the players invest in and control railway companies. The game is part of the 18xx family of games. The printrun is one thousand games and each game is numbered. The gameplay uses the same basic mechanics as other 18xx games. However the focus of the game is more on the operation of the companies, than on the stockmarket. The goal in the development of this game was to create a short 18xx game wich is also suited for players who are new to the 18xx system. For this reason the game was kept reasonably straight forward and there are no extra's, like mergers, loans etc.